By Brian Voo in Culture. Updated on November 13, 2017 . New year’s here; time to start revving up for 2013. Year in, year out, we make resolutions to better ourselves in terms of getting rid of poor habits, picking up good ones, taking better care of ourselves and the people around us, learning to manage our lives better etc. The good news is that in this age of smartphones, we can actually use our smartphones to help us achieve these resolutions. We’ve compiled 40 iOS apps that you can use for free, to help out with your New Year resolutions. Some feature productivity enhancement traits, others help you to watch your finances and your health, and if you have a habit to kick, there’s an app for that too. There’s no better way to celebrate a renewed year with the right spirit to take on the next batch of challenges. Here’s to a fruitful 2013 ahead. Onward to the list! Can’t seem to save enough money to buy yourself all those awesome geeky stuff you really must have? Looks like you need your very own financial advisor, like the ones below. This all-in-one finance manager syncs with all your devices with an account on their website. You can track your expenses and view your budget to ensure you’re not overspending. It also has the option to add bills so that you get reminded of those due dates. For a more business-focused app, Concur can help keep track of and manage travel expenses. Set different currencies and manage hotels or flight plans for overseas travel. You can then generate an expense report when you return home. With Expensify, you can sync your credit cards and bank accounts to track purchases with real-time updates. It’ll be able to track transactions via eReceipts; otherwise you can take pictures of paper receipts, and with that information be able to generate a expense report. HelloWallet allows you to track multiple bank account balances. It also gives you a summary of your budget progress and can average out your spending trends based on categories you’ve created. Mint allows you to add multiple type of bank accounts to your account on their website. You can add your personal bank, credit, loan and retirement account to Mint and it’ll automatically retrieve transactions as you make them. When you have many little ‘accounts’ like rent, phone or cleaning services, then you can manage them with this app. Manage bills for each of these little accounts and remind you when it’s time to pay via SMS or email. With Bills Monitor, you can easily categorize and manage your bills. You can view weekly, monthly, quarterly or yearly reports on your spending in each category and view due dates on the in-app calendar. MoneyPad is a simpler way to manage your budget and expenses. You can set a monthly budget for each category and be able to view if you’ve exceeded your expenses. Pageonce not only allows you to to connect your bank, credit card and investments accounts, but also allows you to pay bills with their app. You can track your spending and bills then get reminders to pay those bills within the secure app. If you want to keep track of your spending through receipts, Shoeboxed allows you to take pictures of your receipts where it will automatically extract the store and expenditure information. Visual Budget allows you to manage expenses of different accounts simultaneously and sort them into different groups at the same time for easier management. You can also set recurring transactions such as your Internet or phone bill. Not too long ago, we featured health-related apps you can download on your iPhone. Here are more apps to add to that list. For easy to do home workouts, Sworkit comes with a few moves and instructions for both strength training and yoga. You then set the amount of time you want to work out for, and it’ll provide a simple workout program for you. If eating healthy is the goal of your New Year, then this app will give you the information and recipes you need to start eating healthy. It features diary free, fat free, gluten free and many other healthier-than-usual recipes to suit your needs. Want a reason to take pictures of your food? This app encourages you to do so and allows your friends to rate what you’re eating. It also keeps track of what you eat and ensures you’re on a good overall diet. If you’re not one to cook at home and find yourself eating out a lot, this app will give you the nutrition information of food you can get in popular restaurants. With this app, you can track your weight loss by inputting food, exercise, weight and water consumption information. It will then take these information and determine if you’re on the right path to losing weight. If you’re closely watching what you eat, this app suggests that you have a 40%-30%-30% ratiointake of carbohydrates, protein and fat in grams. Keying in this information from the packet of food you’re eating will determine if what you’re eating is nutritious or not. Juice allows you to track your sleep, diet and exercise to help you change the way you use your daily supply of energy. It gives you tips to help better the usage of your energy and has weekly reports to track how well you’re progressing. This app has a barcode scanner and a database of all the nutritious info of food with barcodes. It helps you keep track of your meals, exercise and weight to help you get healthier faster. DailyBurn features a combination of tracking your food and calories, and also provides workout and training plans to help you achieve your health goals. During this New Year, if your goal is to break a bad habit like smoking or drinking, we’ve got some apps to help you. Need to pick up a new habit? We got that too. All you have to do is add a habit and then decide if you want to ‘make’ it or ‘break’ it. You then start tracking by tapping the happy or sad face – happy if you succeed, sad if you do not – then watch your progress with charts and graphs. Kickit is an app designed to help you quit smoking by showing you financial incentives. By saving up on the cigarettes you are not buying, you can see an estimate of how many more days are left before you can buy that thing you have been eyeing. 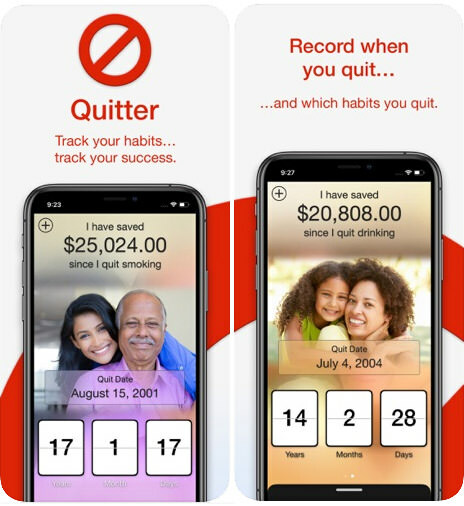 Quitter is an app to break bad habits that cost you money. It could be smoking or a constant craving of junk food. You can see how much you’ve saved each day, add pictures to motivate you and share your progress on social networking sites. If you have a bad smoking habit, then this app may be able to motivate you through each day by showing you how much time and money you’ve saved since you quit smoking. This is a habit-building app to help you identify and track your habits with charts and notes. You can then share these charts with others to ensure you’re on the right path of building a good habit. Bloom will inspire you to create good habits and make better choices as it reminds you to do productive things throughout your day. You can also add pictures and it’ll show them to you via reminders as a way of self-motivation. With only 24-hours in a day, these apps could help you be more productive by better managing your time and daily to-do tasks throughout each day. 30/30 is a simple app that helps you keep track of the tasks that you should be doing. You set up a list of tasks and allocate a specific time for each task. Once the timer for the first task starts, it will tell you to move on to the next task once the time of the first task finishes. We’ve done an in-depth look of Any.DO before, but it needs to be on this list. Having a to-do list and setting deadlines for each list item can help you manage your time better and not miss out on any important tasks. Not only does it work across iOS and Android devices, it’s now integrated into Gmail and you can set reminders right from your mailbox. If most of the members on your family have an iOS device, this app will be able to share family calendars, shopping lists, to-do lists and family journals. Everyone logs in to one account with their own email address and will be able to see daily tasks that each person has to do. Here’s a simple to-do list that enables you to plan out the entire month ahead of you. It also comes with a wide range of image icons to be used together with individual tasks. You can also email individual tasks or folders of tasks as a way to share the information with others. If you’re a busy supermom and need to get a million things done in a day, this app will help you organize a to-do list which you can share with family members via email. You can also get reminders and notifications of nearby locations which can help you complete your errands. Another to-do list organizer that will help you manage your daily tasks easier. You can color-code tasks, sort by priorities or due dates, organize tasks by folders and show a number badge on the home screen icon to easily tell how many tasks you have each day. A reminder app that allows you to set an alarm that repeats each minute, hour or day until you actually complete the task, kinda like having a mom-style virtual assistant who can’t stop nagging you to get your stuff together. You can also share reminders with others via email. This app works really well with the features on their website. With an account on their website, you can set reminders via email, SMS and instant messenger. It also syncs and backs up whatever information you add to your mobile device to the web account. Todoist is a productivity app that helps organize your tasks and works well with your desktop browser or Android device. It also works well with services like Gmail and you can get notification reminders via SMS or email. This to-do app allows for integration with the iOS calendar or Google Calendar. You can easily plan your day by color-coded categories. At the end of the day, you get a colorful diagram that tells you how you spent your time each day. Feel like you’ve hit a brick wall in your career? Maybe these job search apps can help you get a new, better job you want to get up out of bed for. If you’re looking for a job and want an online presence of your skills, then go to LinkedIn and create an account immediately. This app will help you get job-related notifications wherever you are. This app has resources for interview skills to help you get through different questions that the interviewer might ask. You get tips via text, audio and video which you can listen and even watch on the app. Based on the job search site Indeed.com, this is the iPhone app where you can look for jobs wherever you go. Here’s one for UK readers. The UK website Jobsite.co.uk app allows you to search for jobs by skills, location or job type. Results can be sort by relevance, date or salary which you can save into your account. Job applications have to be done via the website.